At Lucky Dog Garage we value and appreciate our community's hero's. This 15% off labor discount applies to our community's Police, Firefighters, and Teachers. Thank you for all that you do! Lucky Dog Garage in Lakeland, MN, is your one-stop shop for all of your vehicle’s needs, including general auto repair, service, and preventative maintenance! Our family owned and operated Lakeland auto repair shop is your vehicle’s best friend! We work on all makes and models of cars and use only the best, state-of-the-art equipment for our repairs and services. Lucky Dog Garage is also the only independent auto repair center in MN that donates $10 for every brake job we do to our local dog rescue shelter. We opened our shop back in 2017 with the hopes of providing our community with auto repair and maintenance that they could trust. Our priority is offering excellent customer service and a friendly atmosphere to make sure that each customer feels comfortable and welcome. Our shop offers a comprehensive list of services, including batteries, lube and oil changes, brakes repairs and services, suspension and suspension, wheel alignments, tire repair, tire rotation, tire balancing, and much more! At Lucky Dog Garage, we invest in the latest equipment and technology to provide our customers with the best quality repairs in the area. Our waiting area is comfortable and offers complimentary coffee, water, wifi, and Netflix. 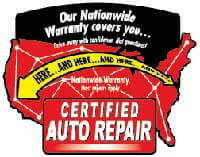 We are an O’Reilly’s Certified Repair Center and offer a 12 month or 12,000 mile warranty on certain repairs and services. We also offer a free shuttle service for local customers and have loaner vehicles available when needed. For professional and friendly auto maintenance and services, give us a call today or stop by our shop here at Lucky Dog Garage in Lakeland, MN. to provide our customers with the best quality in the area!